Katie understands she is in a unique position to use legal skills to help clients solve business problems. This philosophy guides her in all areas of representation. She rarely tells her clients “no,” preferring instead to work with them to determine how they can accomplish goals within the confines of the law, helping clients identify practical and effective solutions. 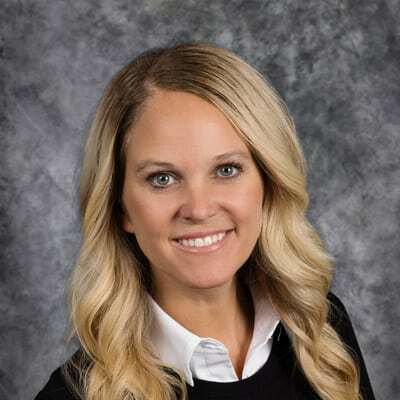 Katie handles all aspect of business law, with a specific focus on contracts, mergers and acquisitions/selling or purchasing a business, business financing, securities, and commercial real estate. She also brings value to business owners by working with them on exit planning goals, ensuring first that they are thinking about their goals, but then helping them put those goals into action. Katie also has extensive experience working with charitable organizations. Once called the “Queen of Non-Profits” by a client, Katie is able to simplify the process of working with the Internal Revenue Service, helping several organizations obtain the desirable 501(c)(3) status. Fantasy football, outdoor activities, and spending time with family and friends. Mother to Ella and Cameron. “Business Transactional Law” sounds really boring. Is it any fun at all? Absolutely. I cannot imagine any career more fun than being able to help people make their dreams a reality. The life of a court room lawyer as depicted on television may seem much more “exciting,” but I get to help people during good times in their lives, when they are trying to start up and run their own businesses. It is neat when you drive down the street and see one of your client’s signs. It is a great feeling to see the fruits of what I have helped create. Why did you choose to settle in the Fox Valley? I am actually a native of the Fox Valley. I grew up in Kaukauna and went to college in Green Bay. I did leave the Valley for three years to go to law school in Madison. Madison was certainly fun and I enjoyed my time there, but I could not wait to get back to the Valley. It offers some of the nicest people you’ll ever meet, great outdoor opportunities, short commute times and, of course, the Packers!